Ofloxacin is a quinolone antibiotic used for treating certain kinds of bacterial infections(ear infections, urinary tract infections) and also useful in pelvic inflammatory disease (PID). It belongs to the fluoroquinolone class of antibiotics. Ofloxacin stops the multiplication of bacteria by inhibiting the reproduction and repair of their genetic material (DNA). Ornidazole is a nitroimidazole which is an antibacterial and antiprotozoal drug used to treat anaerobic enteric protozoa. It is a drug that cures some protozoan infections like (Giardiasis, Trichomoniasis). This antibacterial agent effective against a wide variety of gram-negative and gram-positive aerobic bacteria. It has been demonstrated by recent studies concomitant administration of an antibiotic (Ofloxacin) and antiprotozoal (Ornidazole), shows better symptoms relief compared with the modest improvement of infections with each of the treatments. ● On therapy for the treatment of patients ofloxacin suspension help to cure Mild to moderate infection due to susceptible strains of designated microorganisms. ● It is used to treat certain prostate infections and sexually transmitted infections. ● Trichomoniasis of uro-genital tract and bacterial vaginosis. ● Ornidazole suspension is Used in the treatment and prophylaxis of susceptible anaerobic infections in dental and gastrointestinal surgery. Inhibits the enzyme Bacterial DNA gyrase. It has activity against C.trachomatis, M.leprae, M.tuberculosis and other Mycobacterium spp. The antimicrobial activity of ornidazole is due to the reduction of the nitro group to a more reactive amine that attacks microbial DNA, brings about loss of helical structure of DNA and subsequent DNA breakage thus inhibiting further synthesis and causing degradation of existing DNA. Pertaining to the ability to destroy or inhibit other living organisms. A substance derived from a mould or bacterium, or produced synthetically, that destroys (bactericidal) or inhibits the growth (bacteriostatic) of other microorganisms and is thus used to treat infections. Before taking this medicine tell the doctor about any medical problems an allergies that child has now or has had. This suspension is the combination of Ofloxacin and ornidazole and has unique dual mode of action i.e., in the combination, ofloxacin may increase the anticoagulant effect of acenocoumarol and anisindione. Calcium salts such as calcium acetate may decrease the absorption of quinolone antibiotics such as ofloxacin. Of concern only with oral administration of both agents. Potentiates effect of coumarin-type oral anticoagulants.prolongs the muscle-relaxant effect of vacuronium bromide. ● Headache are the commonly reported side effects. ● The other side effects occurring to a lesser extent are nausea. ● Abdominal cramps are the most common. ● Occasionally diarrhea an dryness of mouth. Neurological disorders, Blood dyscrasiae, Caution when used during pregnancy, Caution when used during lactation. Concomitant use with alcohol should be avoided. 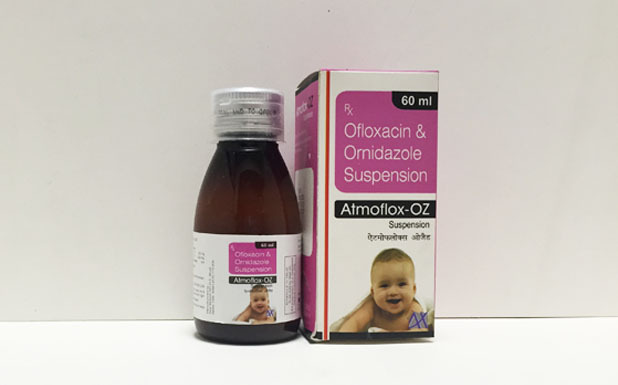 From the above discussion it can be conclude that this Ofloxacin & Ornidazole suspension could improve the quality of life of children's with infections as well as Diarrhea, Peritonitis ( A combination of ofloxacin & ornidazole can also be used to treat Hansen's Disease, or leprosy).